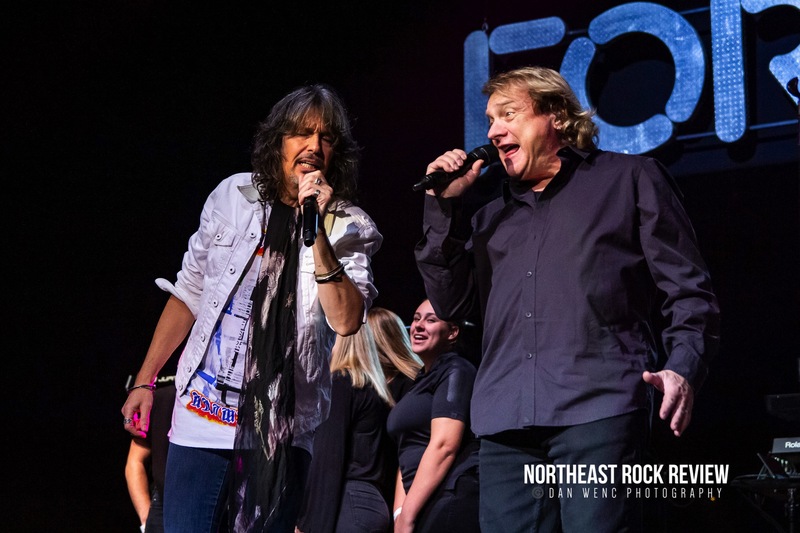 It was a night to celebrate a band that has transcended decades and thier timeless songs that have been popular for the past 40 years. 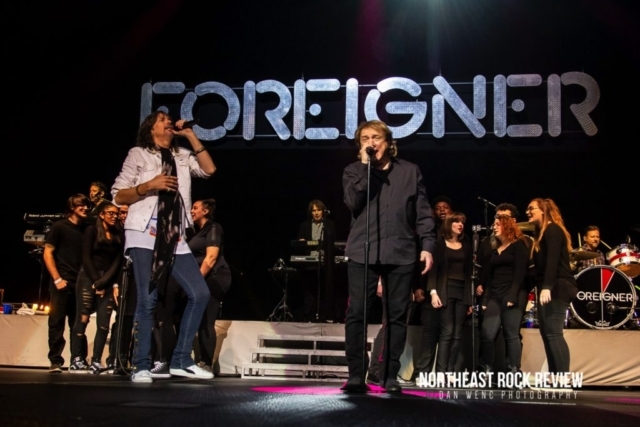 This was a historical performance that brought together two eras of the musical legacy that is Foreigner. 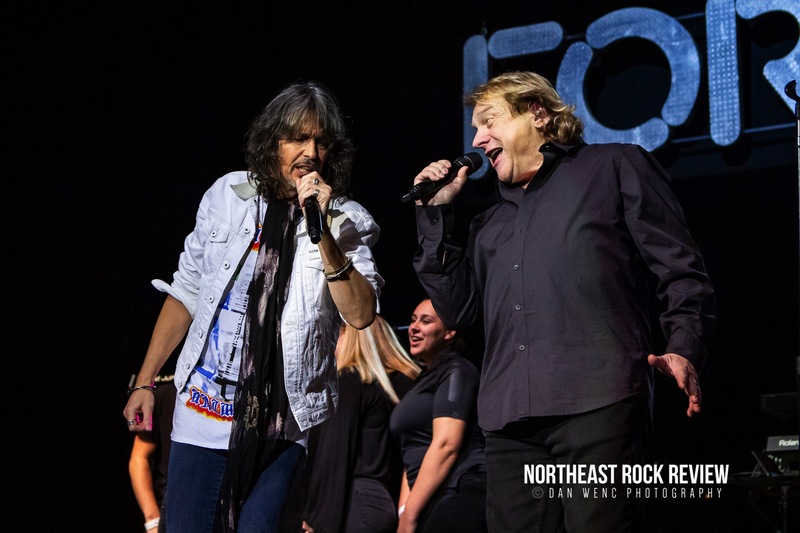 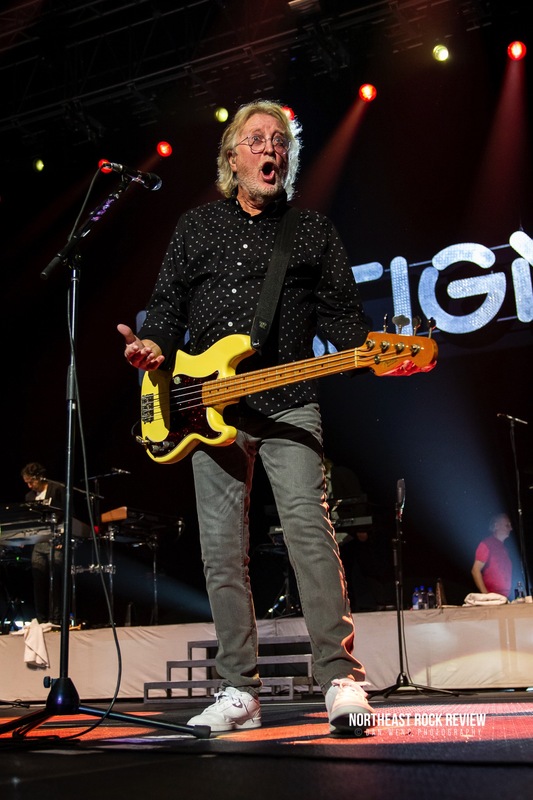 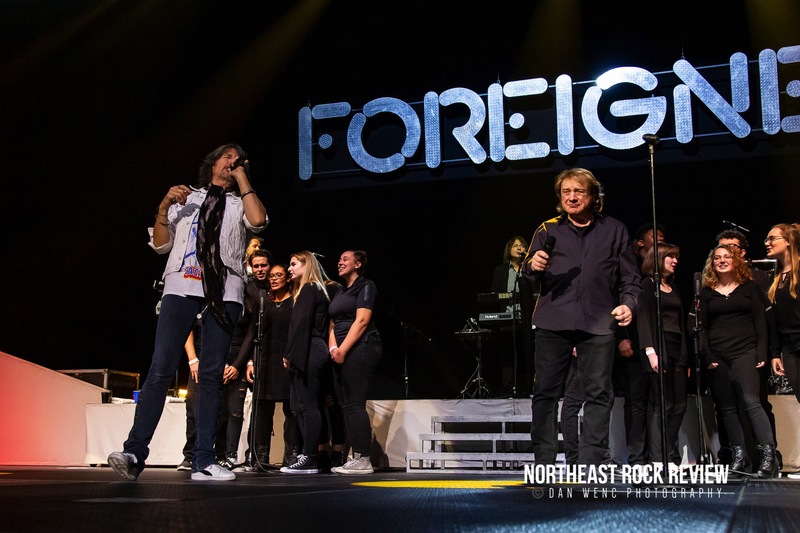 A night of celebration for members of the band who created the memorable and iconic Foreigner hits. 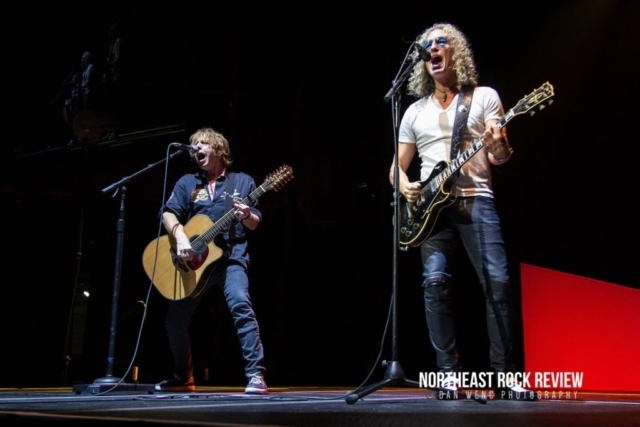 A top notch performance of the two versions of Foreigner coming together on one stage, both playing with visible enjoyment and appreciation of one another. 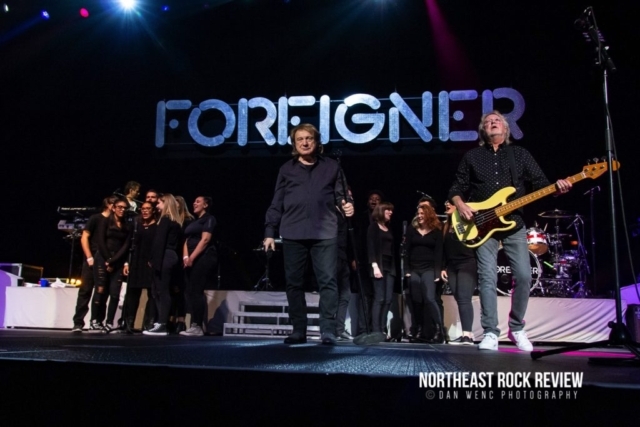 This show was one of those musical events that will probably not be recreated anytime soon, making the night that much more meaningful. 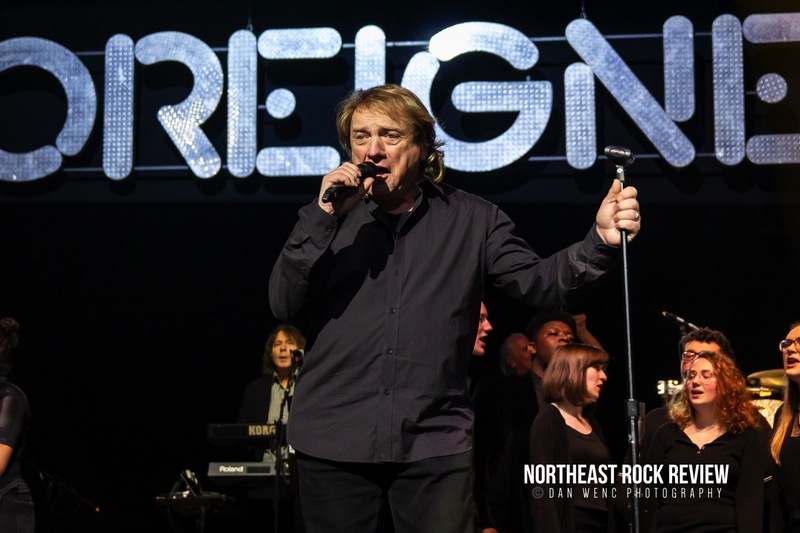 It was great to see Lou Gramm on stage with Mick Jones and the other members who created the songs of the soundtrack of our lives. 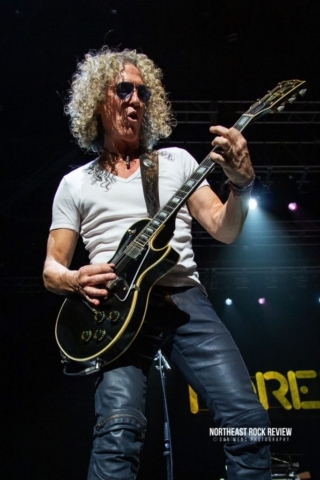 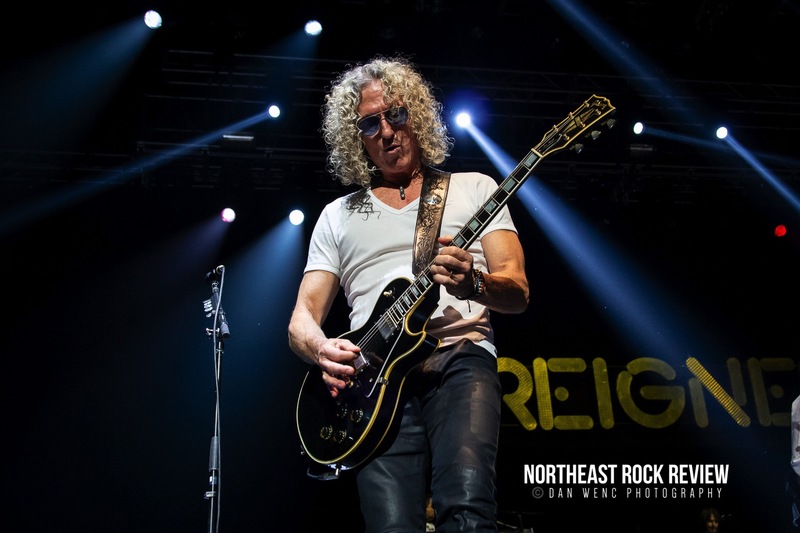 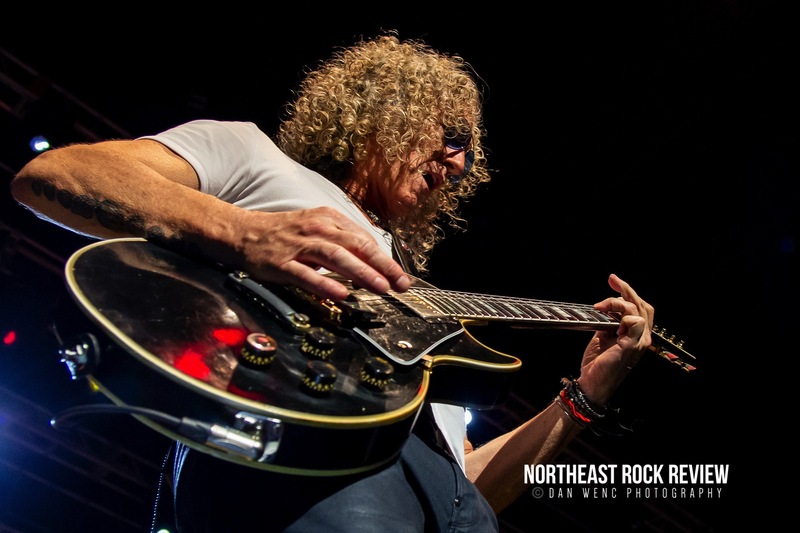 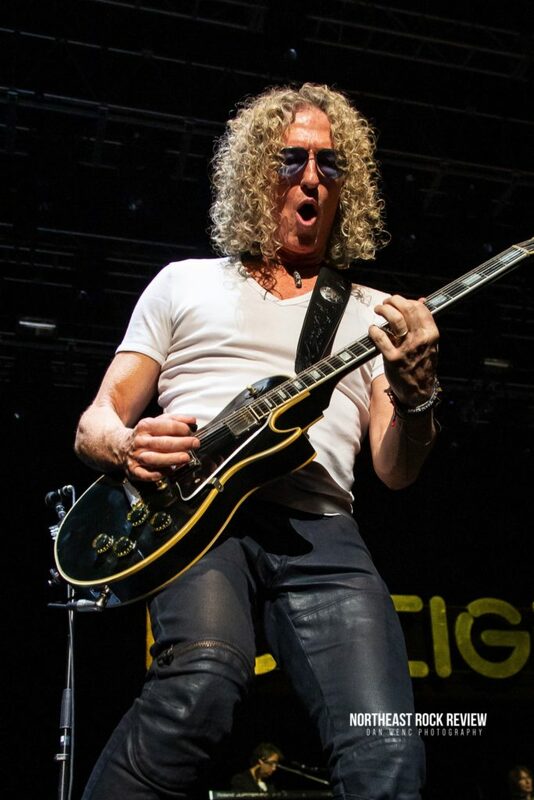 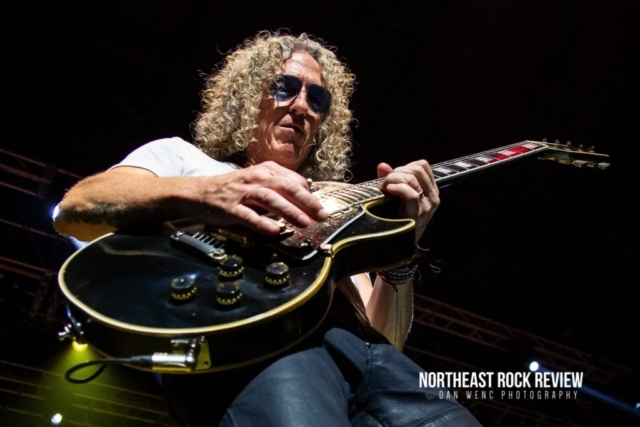 The Now, Kelly Hansen, Mick Jones and the modern lineup, do great justice to the Foreigner classics in keeping them alive and filling venues for the fans that want to see them perform. Kelly Hansen’s voice is spot on for the songs and is a highly entertaining frontman. This show was a grand slam. 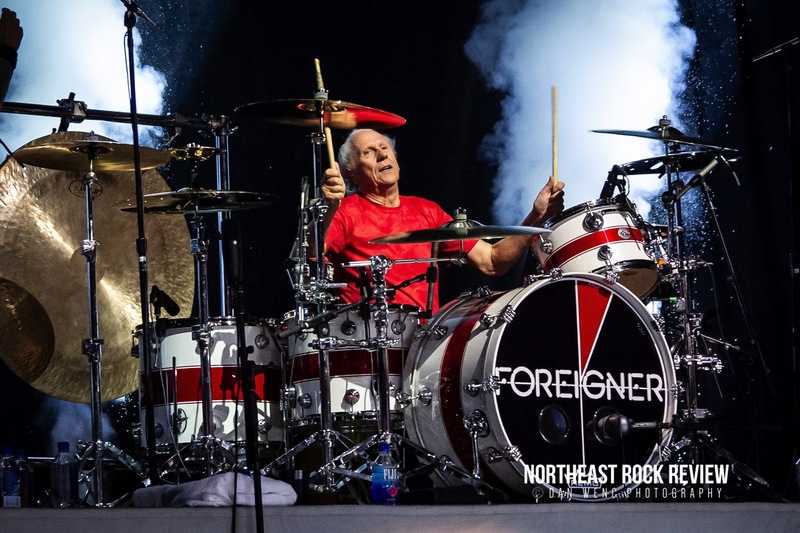 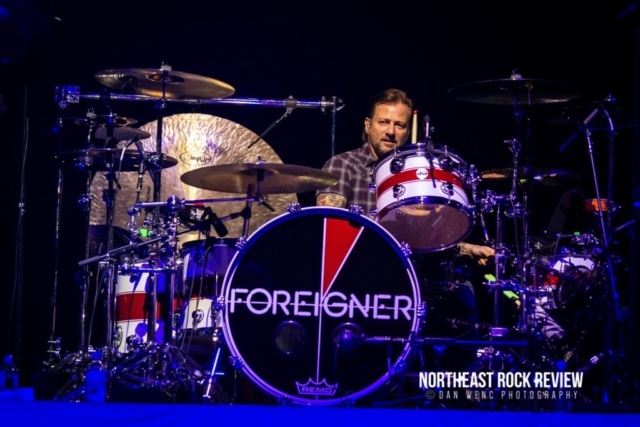 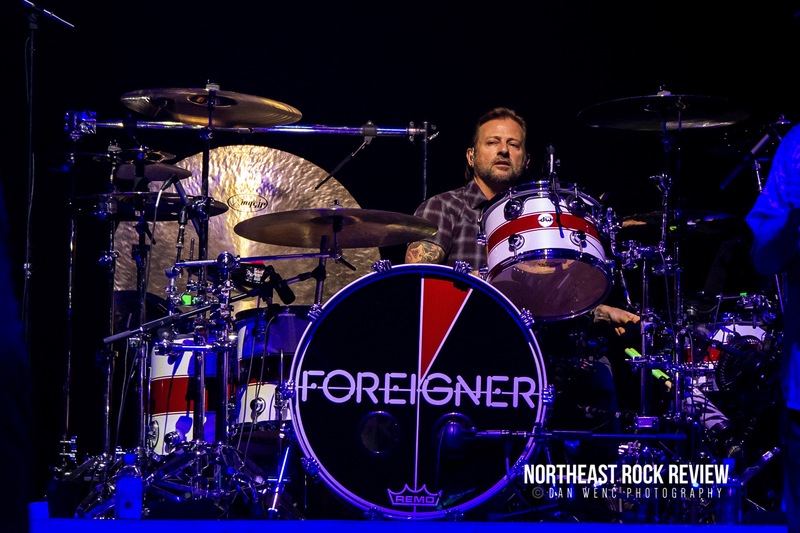 The night started off with a minimalistic stage set up, with only microphone stands at the front, and drums and keyboards to the back of the stage under the large FOREIGNER backdrop. There was no opening band so it was straight into the good stuff. The night started off with the current lineup of Foreigner opening with “Cold As Ice”. 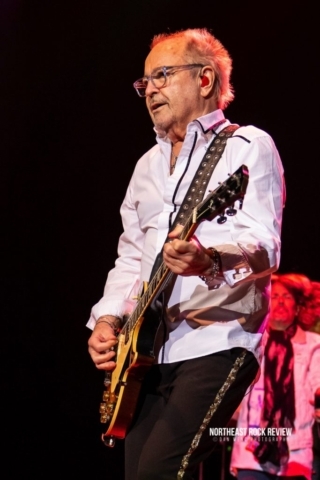 The first half of the night was with the current lineup, minus Mick Jones, who is regularly still in the current line up with the band. 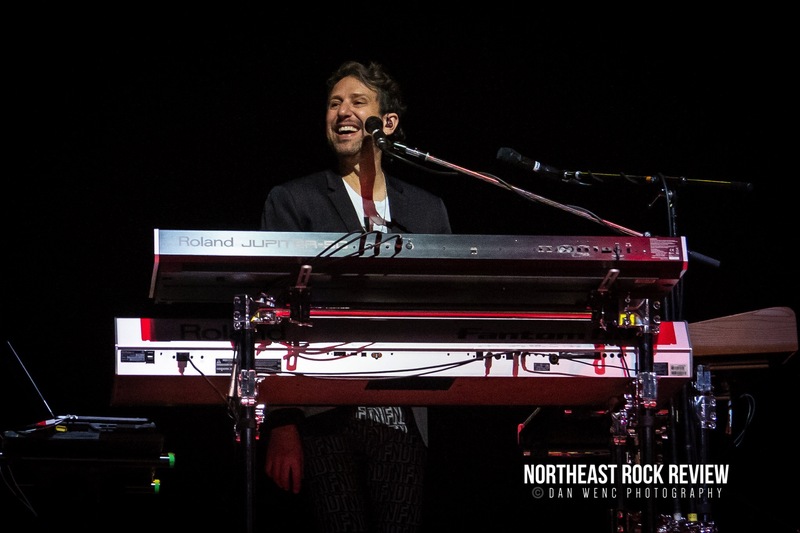 The band took the stage and started off the night amidst a full arena, the crowd swelled with roars through the set. 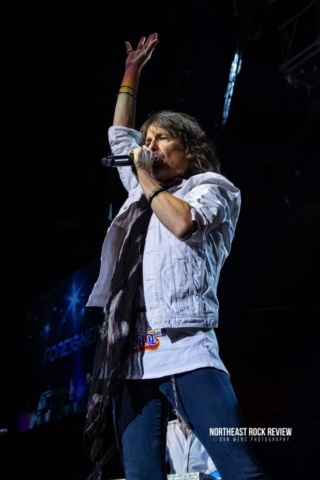 Especially when Kelly Hansen departed from the front of the stage, out onto the arena floor, walking through the crowd all around the floor towards the soundboard and rounding back to the stage on the other side of the arena, during a lengthy, melodic end of “Cold As Ice”. 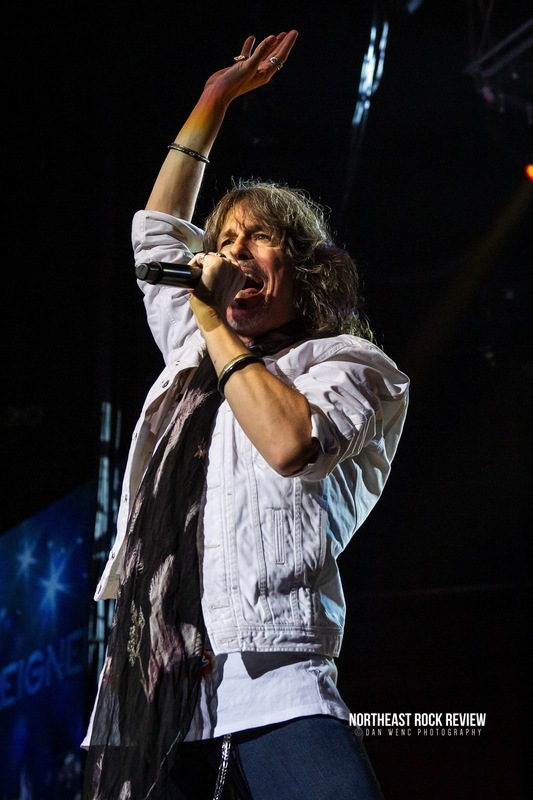 Kelly Hansen is not only a stellar vocalist, he is a great showman. 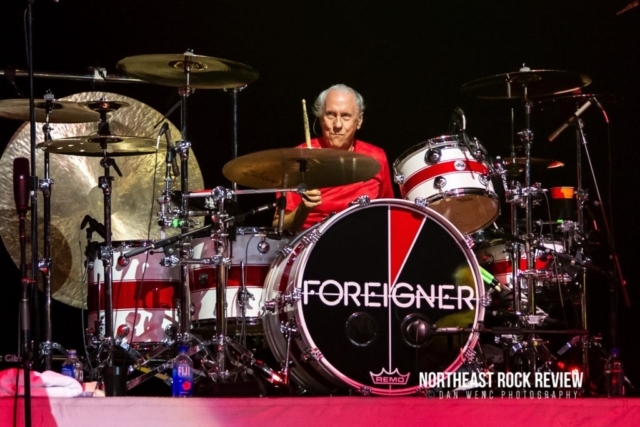 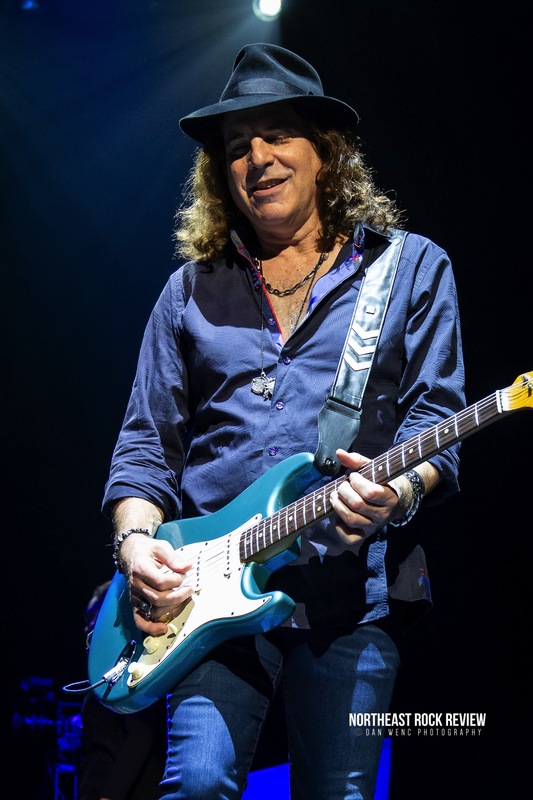 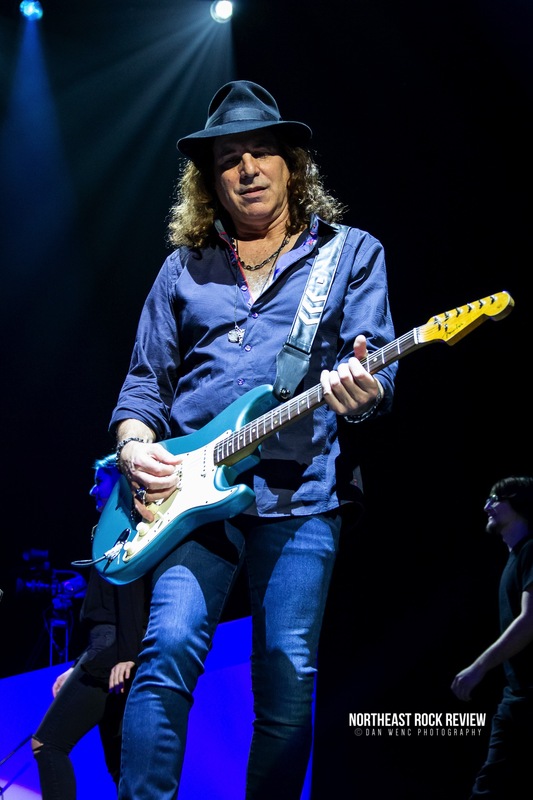 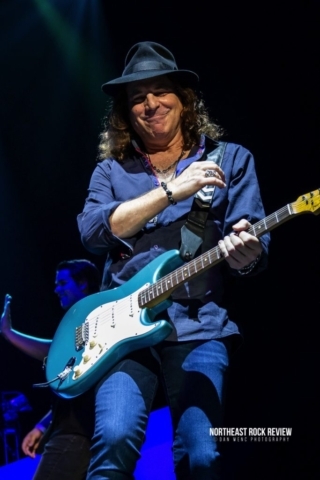 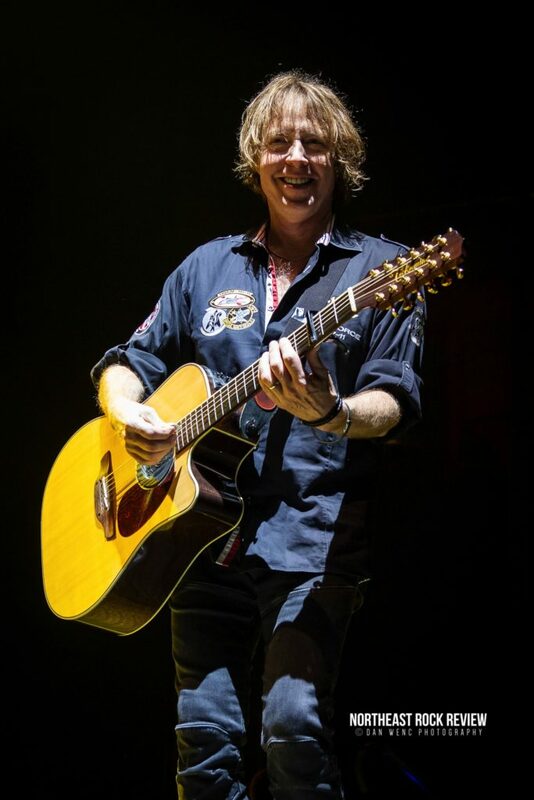 Hansen took moments throughout the set to talk with the crowd, describing the crowd as the true Foreigner fans. 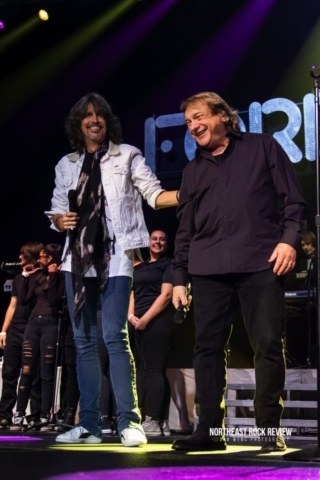 This was the last show of 2018 for Foreigner and the last performance with the classic members. Everyone in the crowd might not have been aware of what was in store for the night with the original/classic members. Hansen didn’t let on what the rest of the night would bring, but hinted of special guests that would be taking the stage later that night. 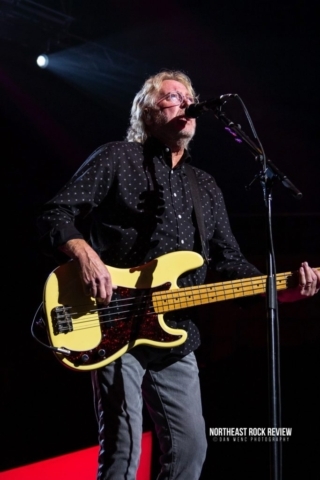 Hansen said of the night, that they would get to play more songs that they don’t normally get to play. 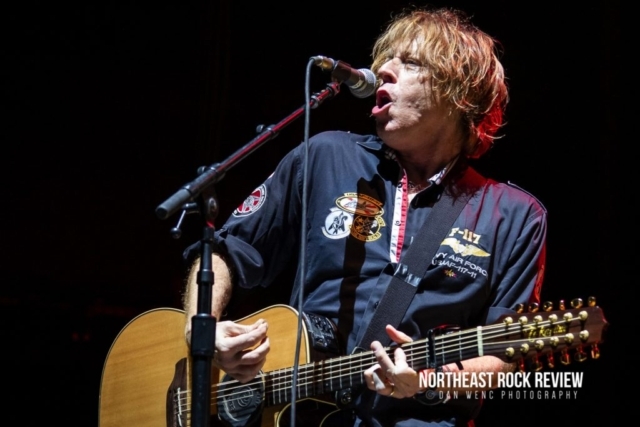 “That Was Yesterday” and “Headknocker” were well received. 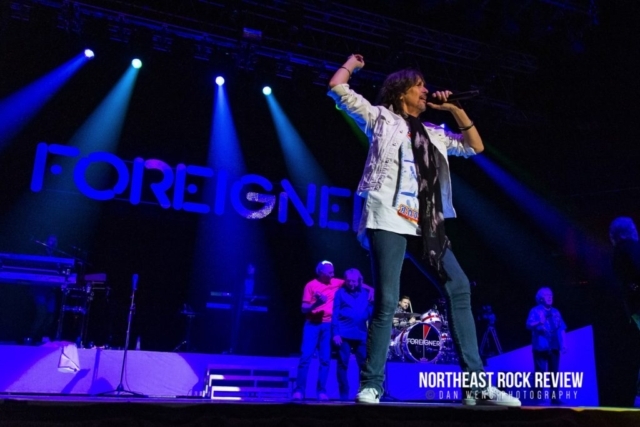 The crowd continued to follow up each song with booming applause and cheers. The band appeared happy and enthusiastic as the moved about the wide stage. 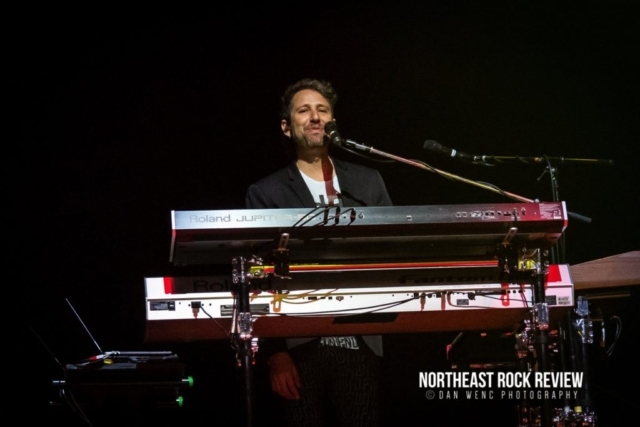 The final song of the modern players’s set, “Juke Box Heroes” started off with a dueling drum and keyboard solo intro with in an extended version of the classic hit. 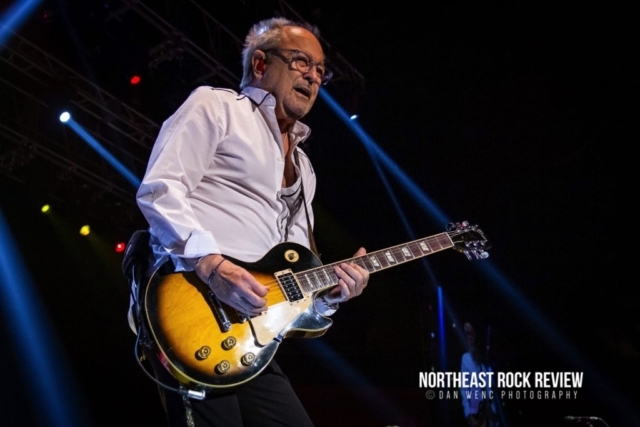 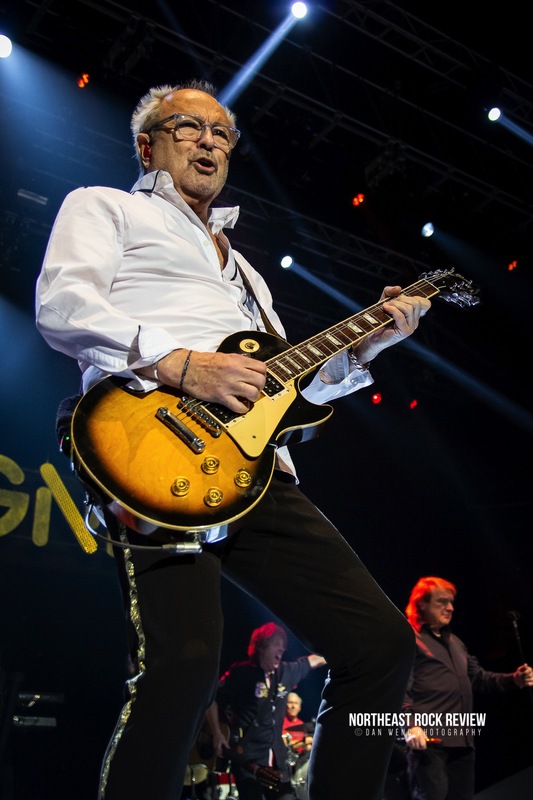 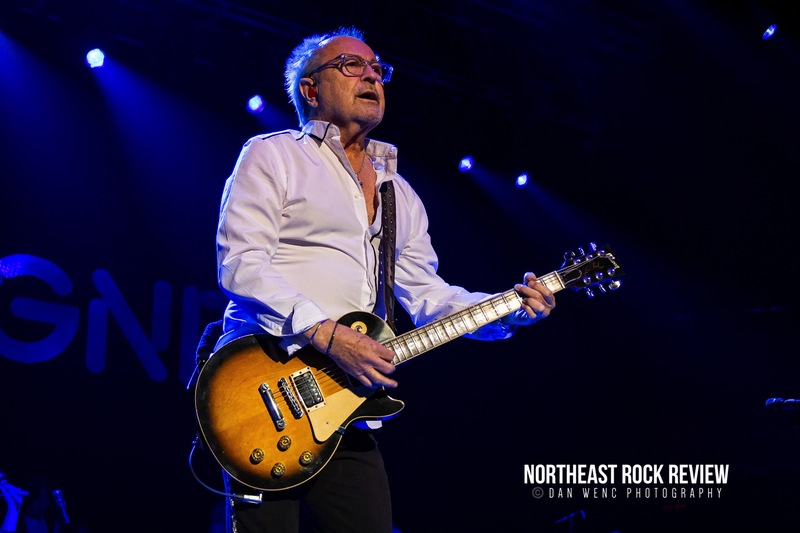 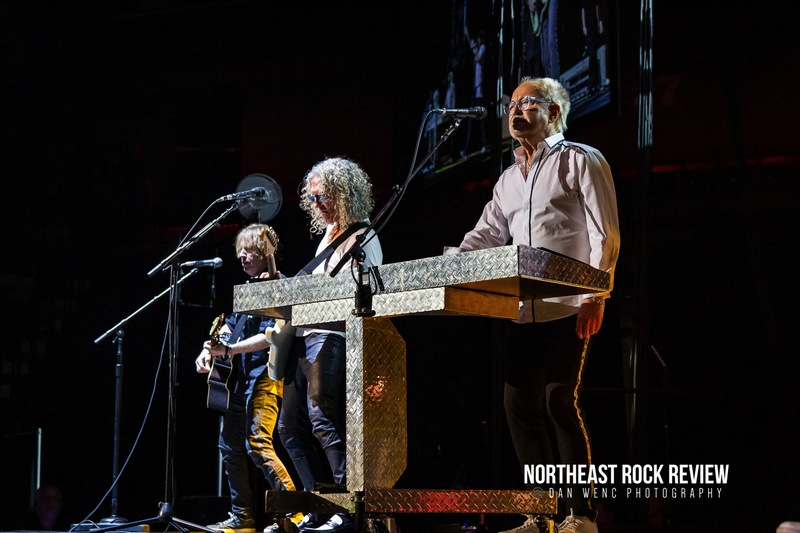 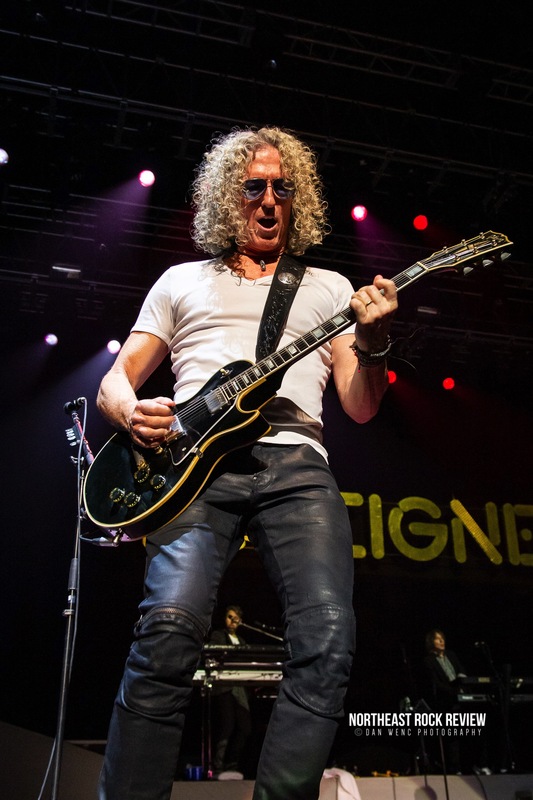 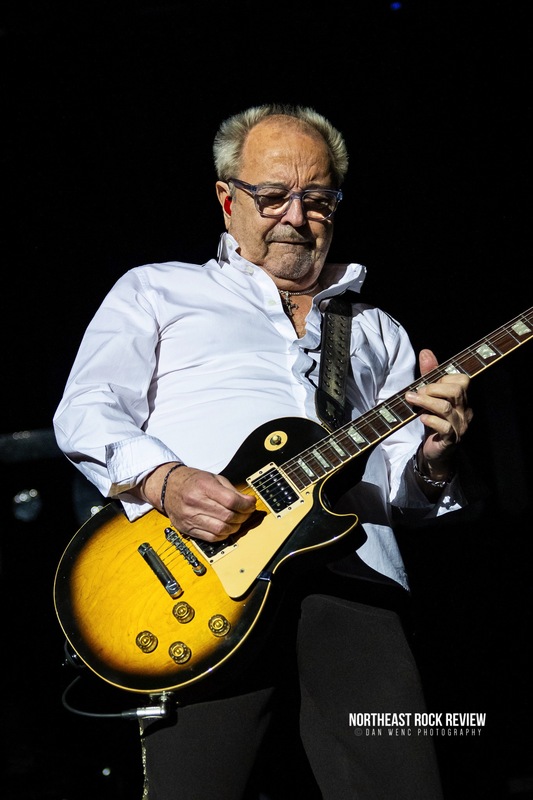 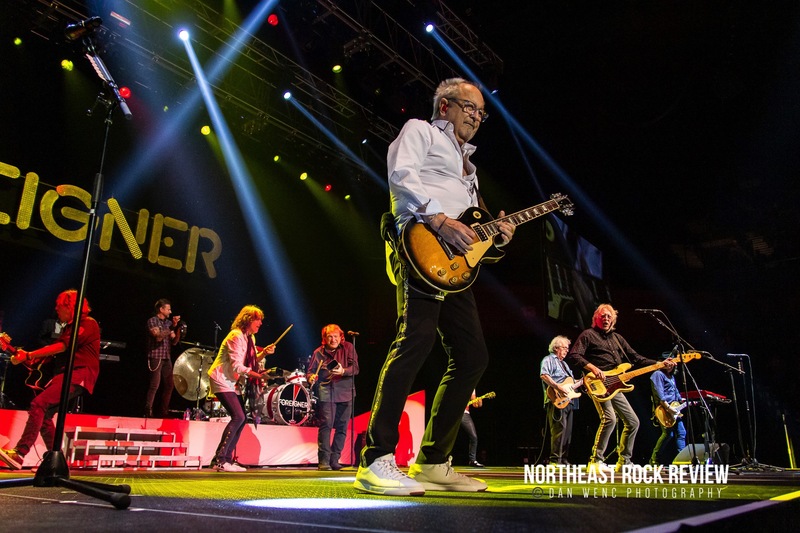 During that song, the classic members of Foreigner, including Mick Jones could be seen off the stage watching them perform waiting to go on next. 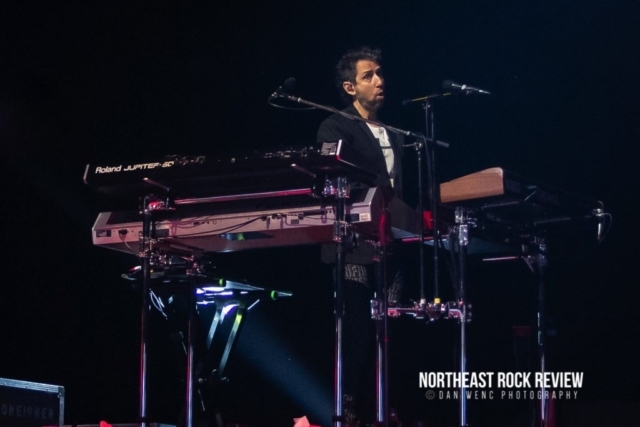 The modern versions set ended in an eruption of energy. 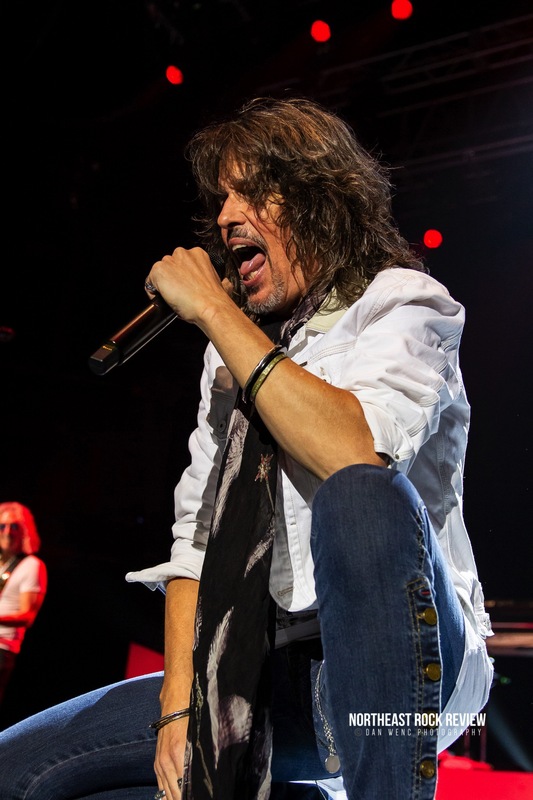 On completion of the set, Kelly Hansen said that they were going to make some changes and that they would be right back. 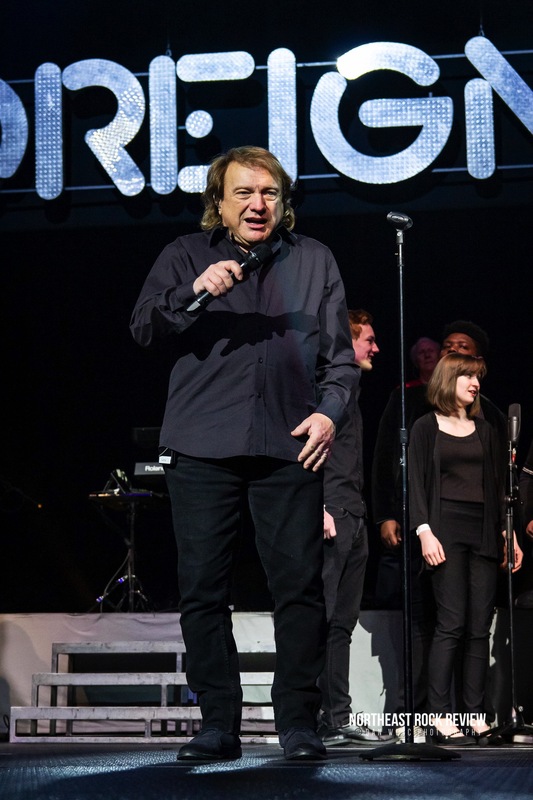 Hansen said you think you’ve heard all the hits you haven’t seen anything yet. 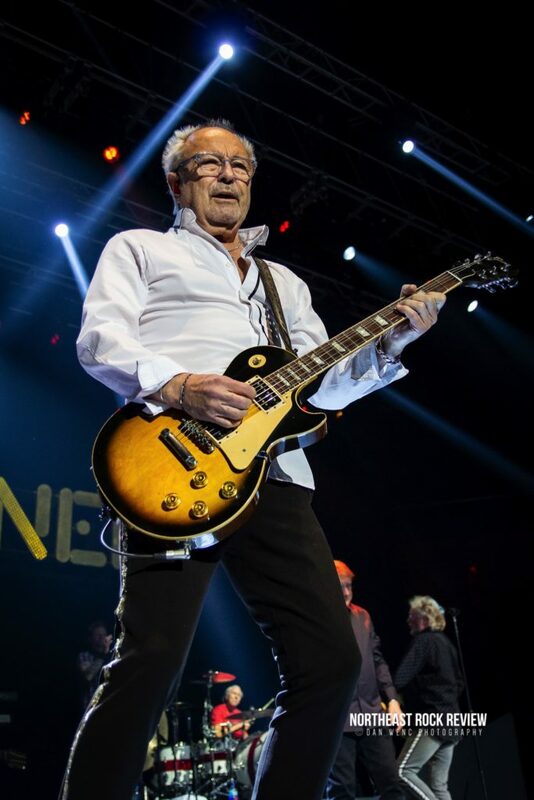 After a quick momentary break, Hansen, who has been with the band for the past fifteen years, returned to the stage. 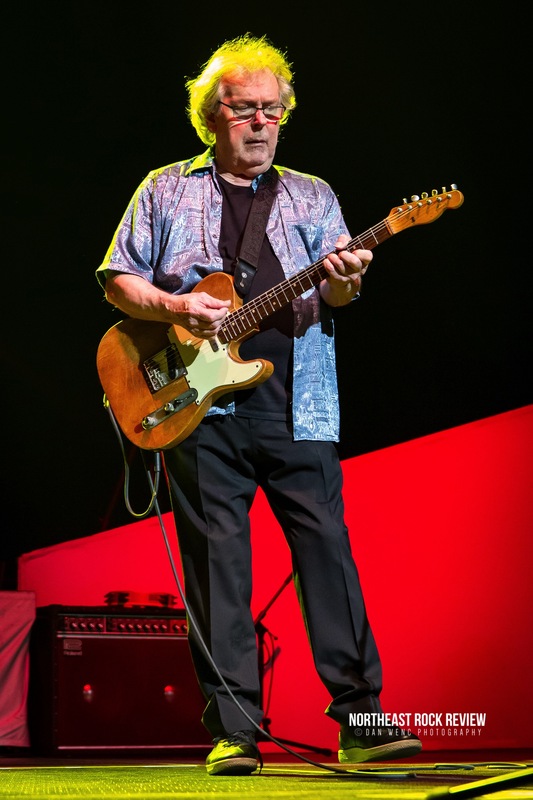 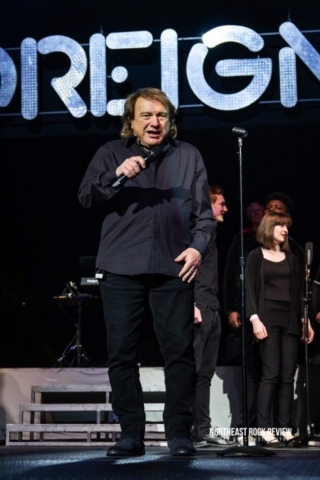 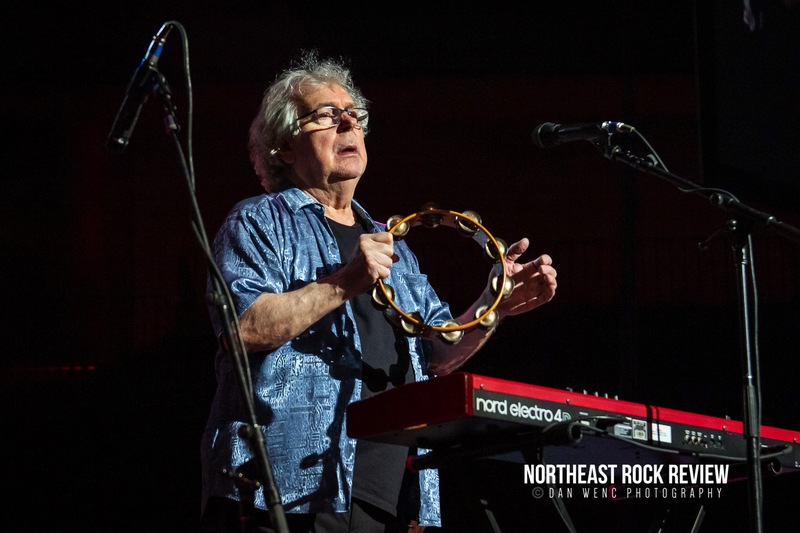 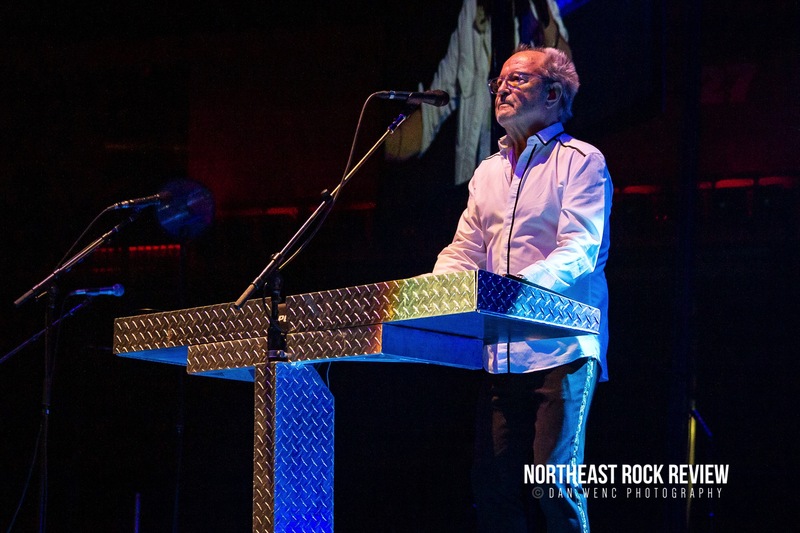 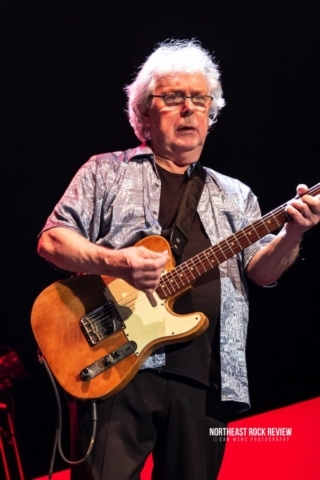 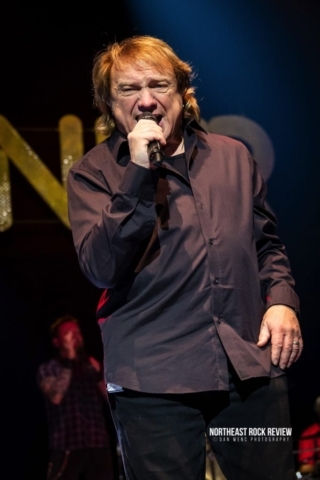 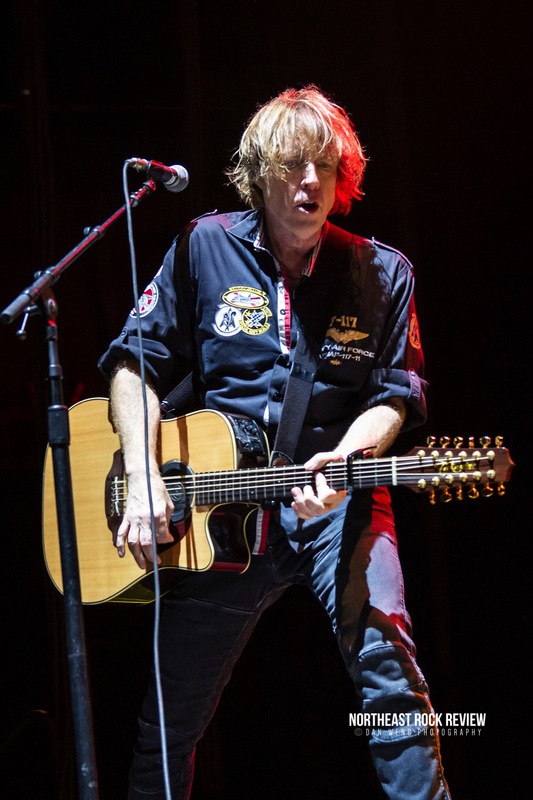 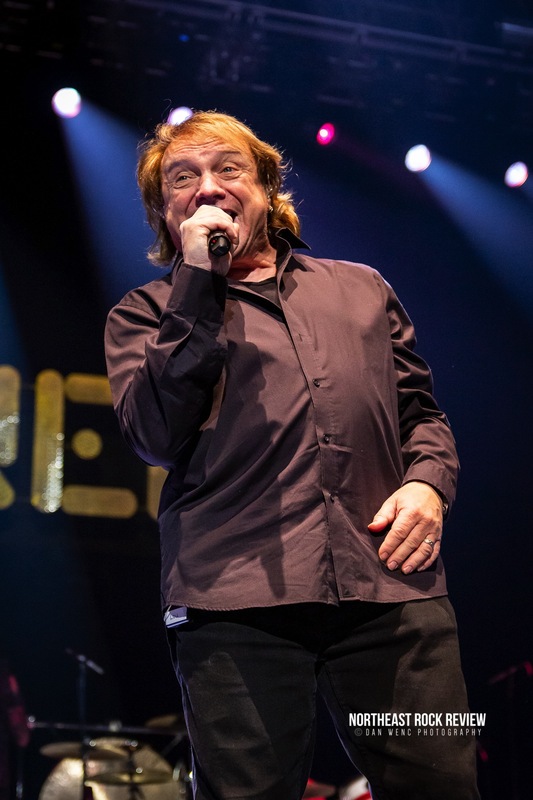 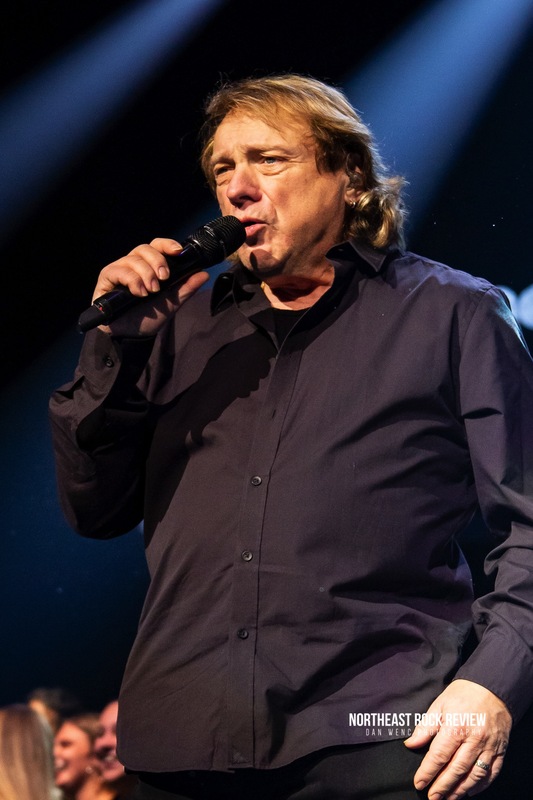 Hansen took moment to speak with the crowd, he talked about the band still celebrating its 40th anniversary and it was time for reunion, he paid honor to those musicians and songwriters who created those Foreigner songs who were about to take the stage. 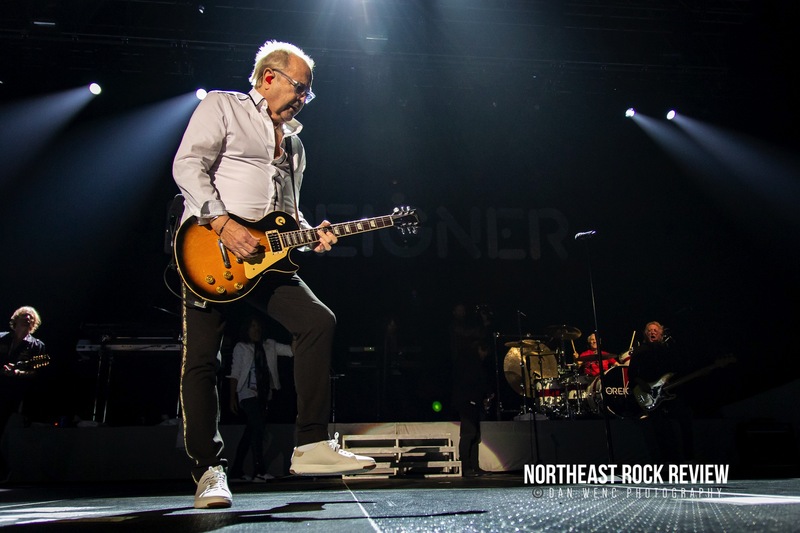 Mick Jones then entered the stage and took to the microphone with roar of the crowd. 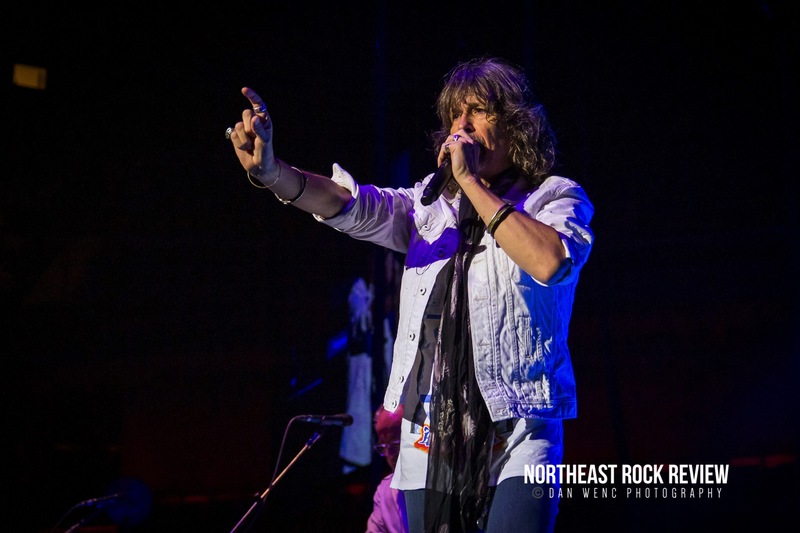 Mick announced each band member for the second half of the evening. Each member was introduced one by one. 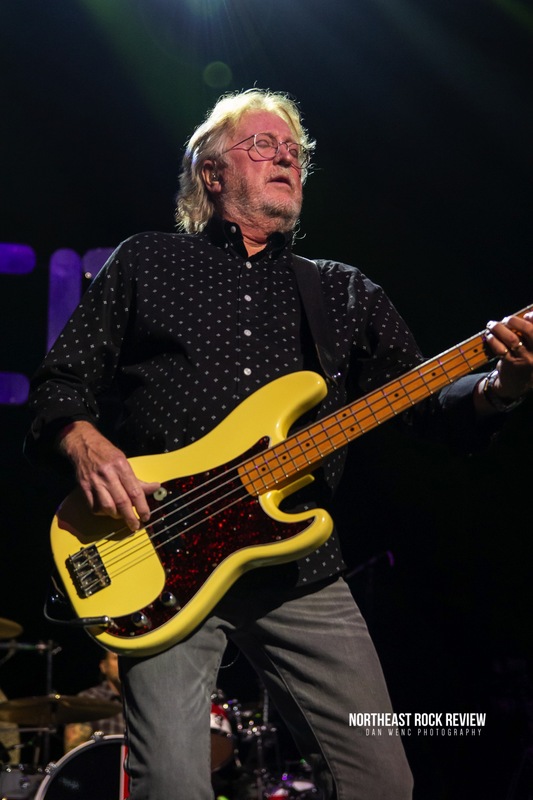 Rick Wills on bass, Ian McDonald on guitar, Al Greenwood on keyboard and Dennis Elliot drums. 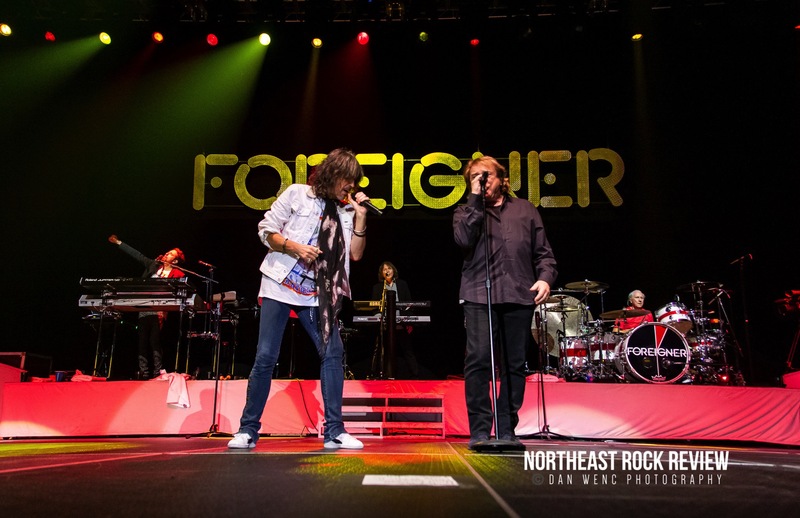 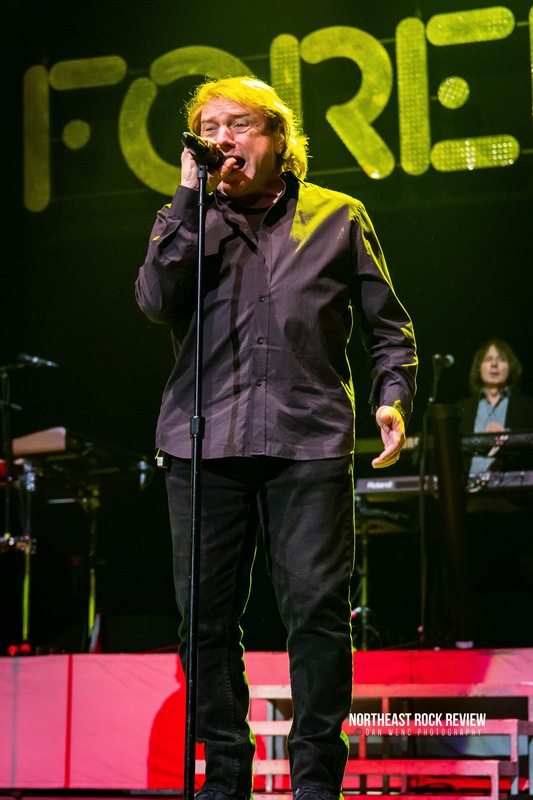 Then it was a moment, that many a Foreigner fan had long been waiting for… Mick introduced original vocalist, the legendary Lou Gramm. 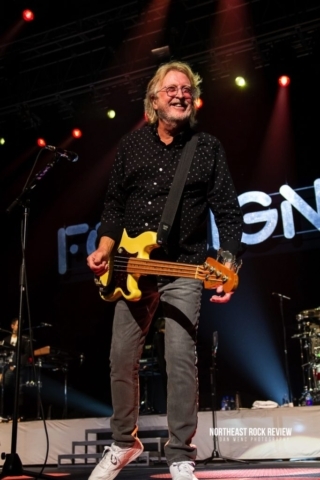 Lou made his way to the center of the stage and said a hello… and “let’s start from the beginning”, going right into “Feels Like the First Time”. 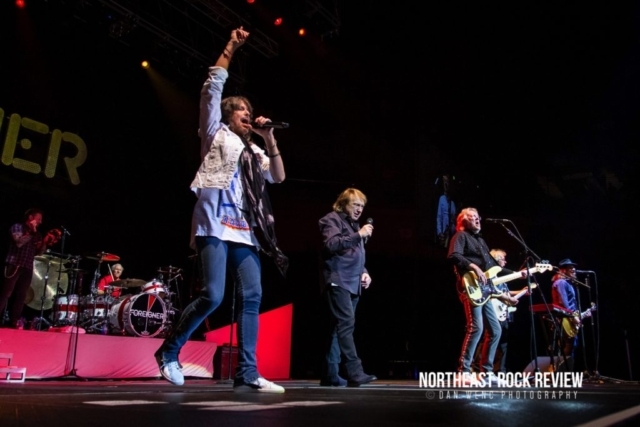 The energy in the arena was magic and set a nostalgic vibe for fans and the band. 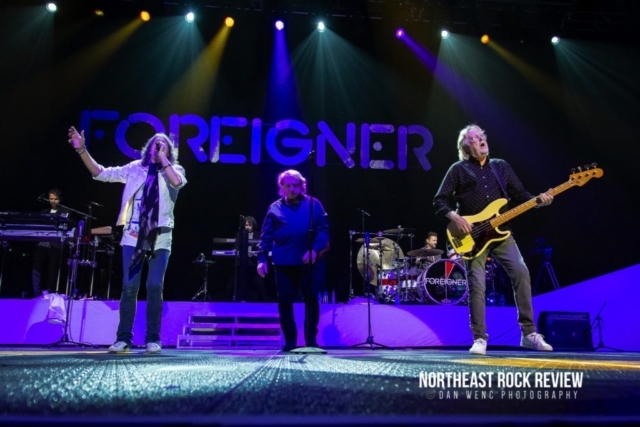 It is confounding to know that Foreigner is still not in the Rock and Roll Hall of Fame. 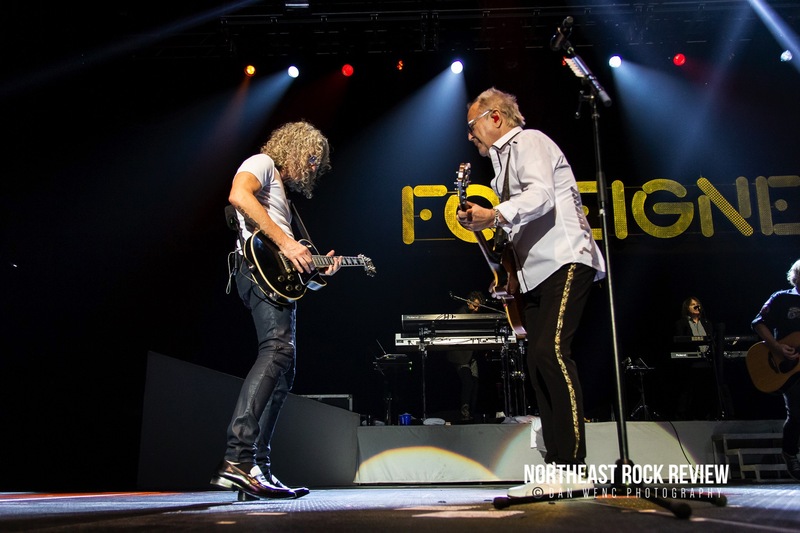 Fans don’t need the hall for them to know this music catalog are filled with some of the most iconic songs that are iconic of the 70’s and 80’s. 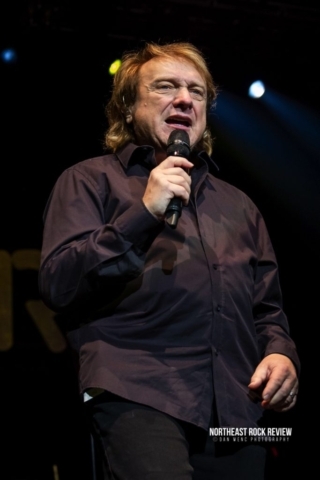 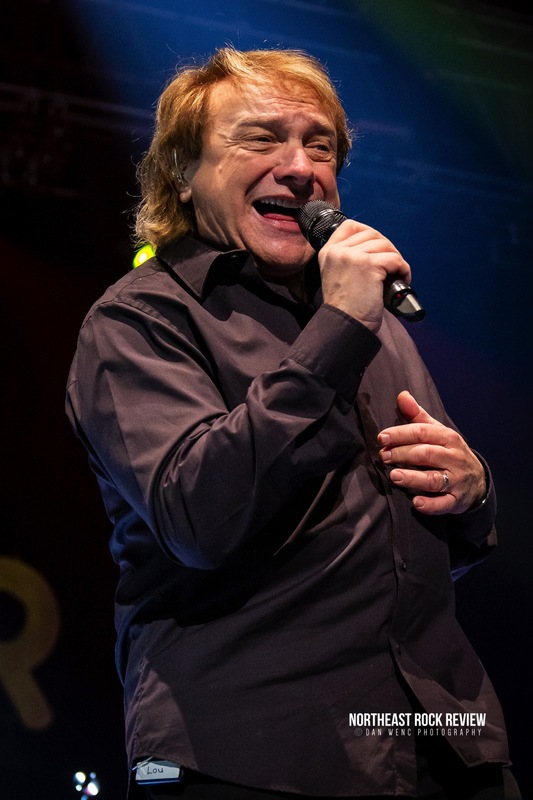 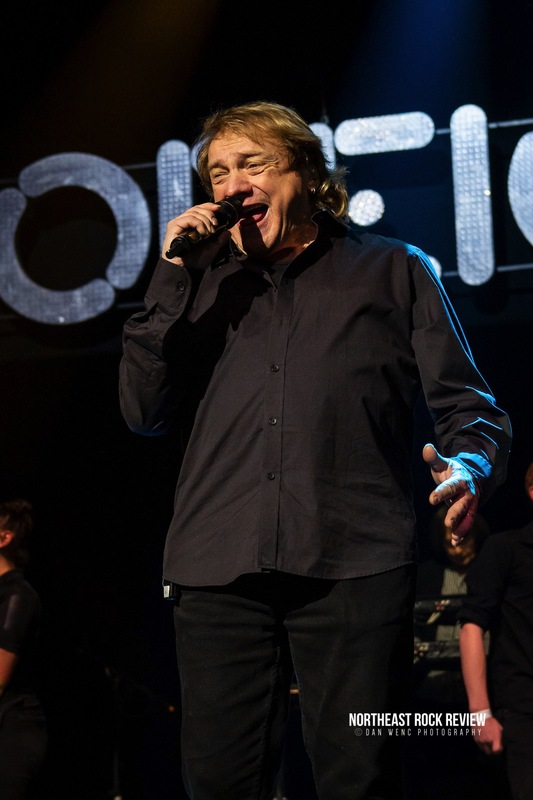 In 2013 Lou Gramm and Mick Jones were inducted into the Songwriters Hall of Fame, most deservedly so, as they were the creators of some of the greatest songs that have been part of the soundtrack of our lives. 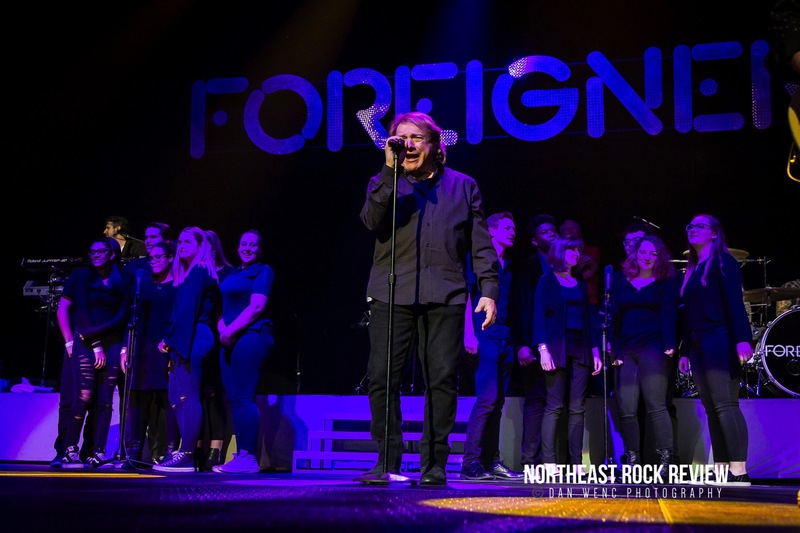 The night closed off with both the current and classic lineup joining each other on the stage to perform “I Want to Know What Love Is”, additionally joined by a local choir. 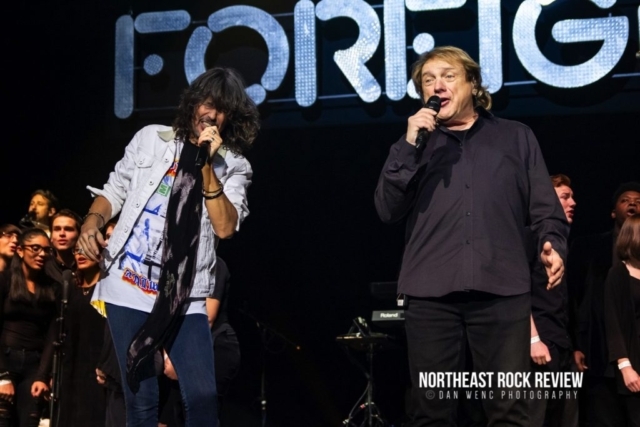 Kelly Hansen and Lou Gramm traded verses and sang together. 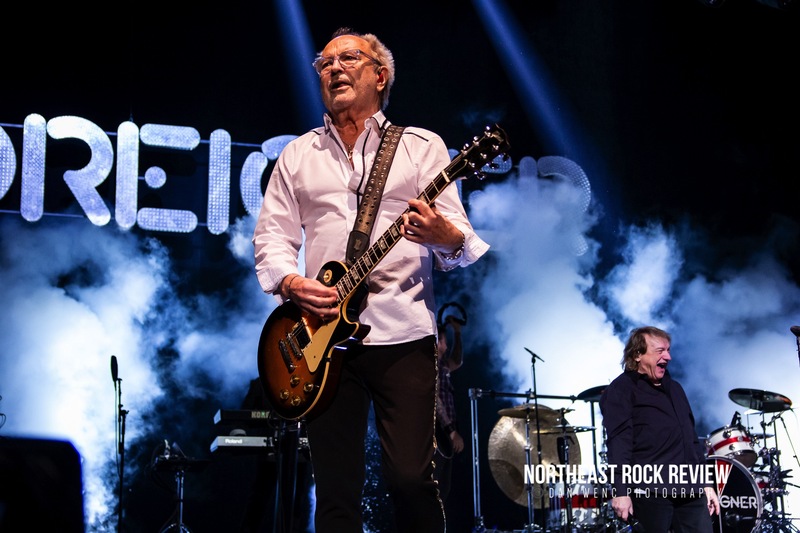 The final song of the night was “Hot Blooded”, which was fueled by high crowd energy and obvious nostalgia and great vibes on stage between the classic and current line up. Regardless of which version of Foreigner entertains you the most, you just can’t lose with either one. The (Now) modern version with Mick Jones, had just come off highly successful 2018 summer US Tour, Juke Box Heroes Tour, and then had been playing tour dates overseas. This night was a historical musical event and everyone in that venue was fortunate to have been present. 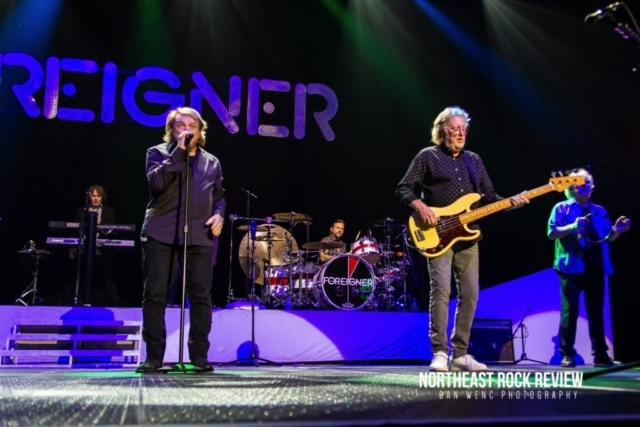 A true celebration of a legacy band that has provided great music for the past 40 years.